The trimming is a two part process on these. The first trim is to run the part around a small laminate trimmer with a bearing, this gets rid of the bulk of the plastic sheet. The second trim uses a dremmel with an 1/8" guide point bit that follows the flange, cutting off any additional remaining plastic. 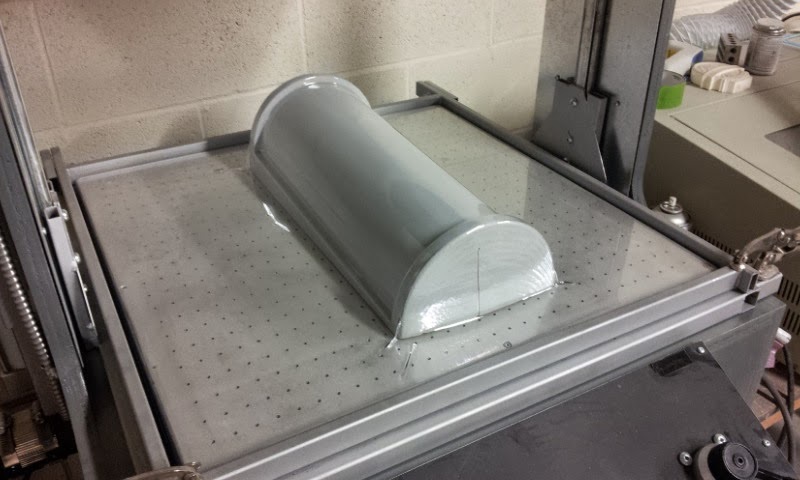 I'm sure John was super excited to trade in vacuum forming for this crappy job! I glued up a couple of sections of the tubing to see what it was going to look like. The pop bottle is in for scale. These are pretty large sections! 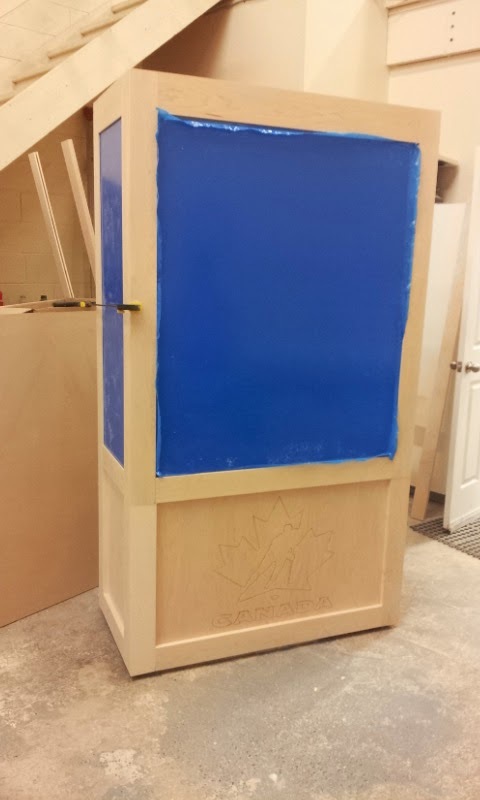 The other project in the shop at the same time is some cabinets for a travelling "Hockey Canada" museum. 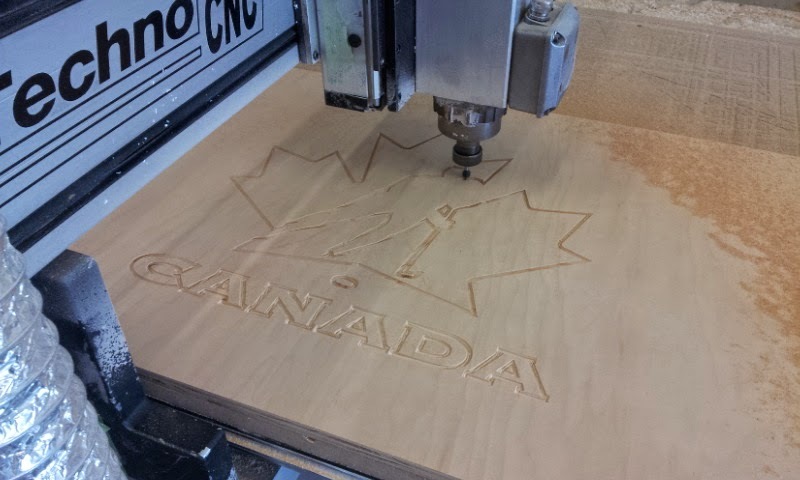 2 of the maple cabinets get the logo carved into the face, so our Techno did that while I assembled the remaining portions of that cabinet. It looks great front and center! 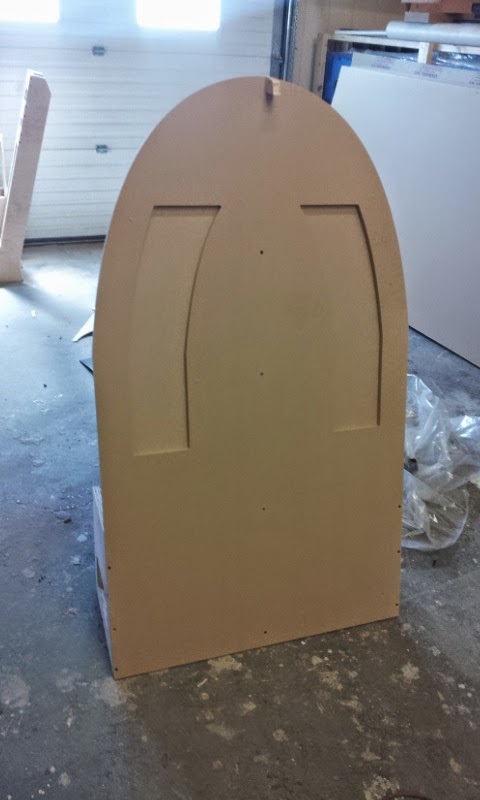 Heres one of the final cabinets. There are actually 2 of these that bolt together around a 6 in steel pipe. The pipe becomes the "hinge" that lets the cabinet rotate as a pair 90 degrees. 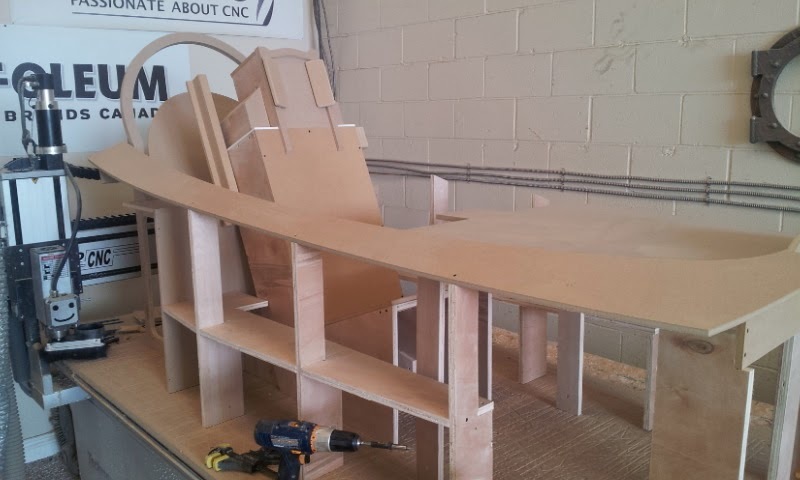 This will allow the custom trailer's sides to roll inwards without hitting the cabinets. One of these cabinets gets to hold the Stanley Cup! The good news is my stack of maple is quickly getting smaller! With the overall shape of the slide approved, I took my low resolution tubes I created in Hexagon, and converted them to hi-poly models. Our Techno would machine all the facets of the low res version if I didn't do this. 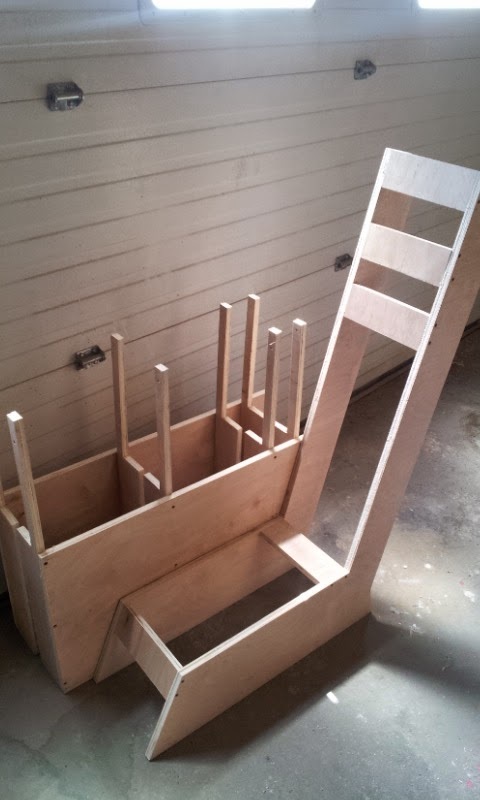 I also extended the flanges on all sides, and brought everything down to an even base plane. The model imported into Aspire perfectly! 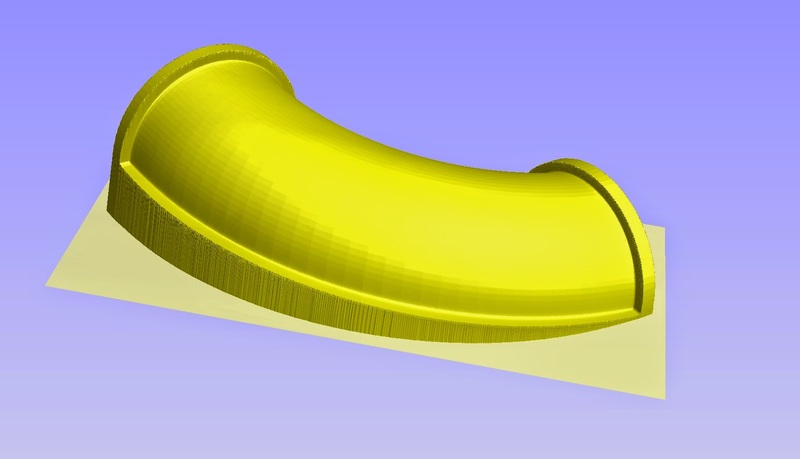 I added a 5 degree draft in Aspire to make releasing the vac-formed shell a whole lot easier. 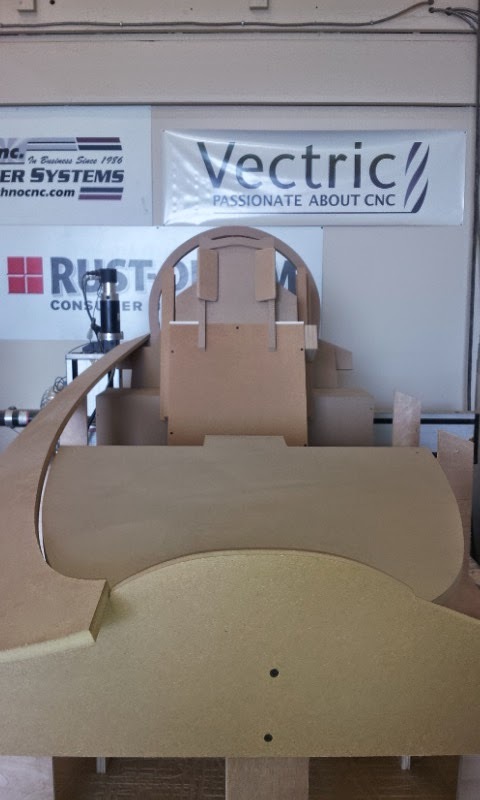 I can't have any draft on the inside flange, as this will change the angle of each piece, causing the whole slide model to be waaaaaaaaay out of alignment, and size! The solution was to draw a polyline, that will split the drafted model from the regular version, and then combine the two versions into one. The result worked great, draft on the outside edge, no draft on the inside edge! 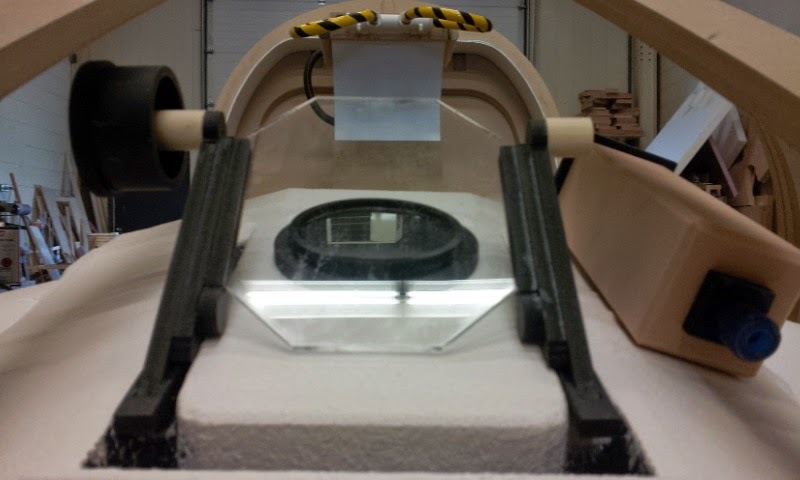 I machined all 5 molds from HDU board, allowing me to zip through the material pretty quickly. 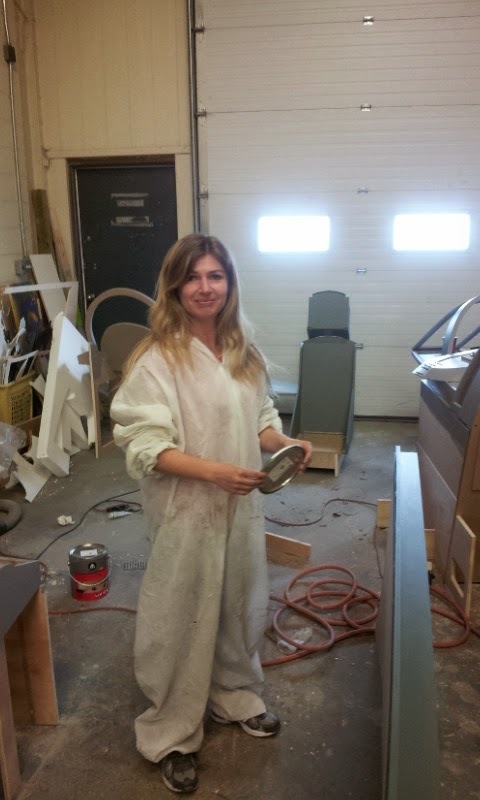 By the end of the day, I had the molds finished, cleaned up, and coated with a 2 part polyester hard-coat. 30 minutes in the sun, and they were rock hard and ready for final sanding. They pulled really nice! 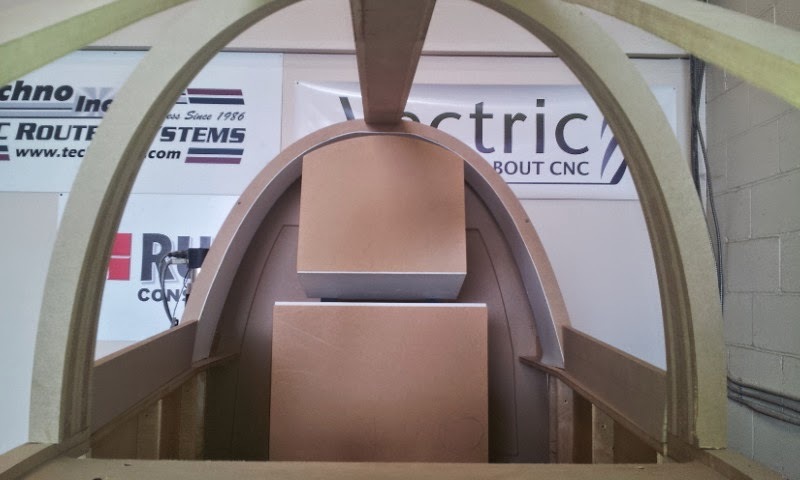 The tight 90 degree molds are quite a bit taller than the rest, so removing the draft from the inside edges made popping the mold out a bit harder than the others. 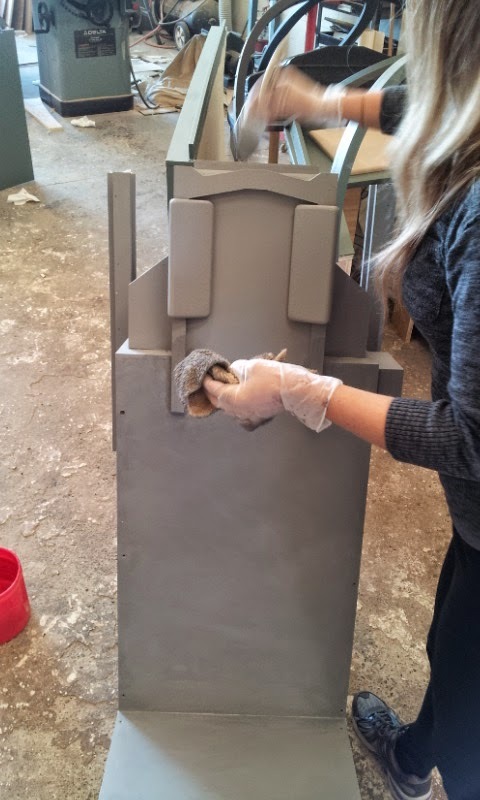 But a little baby powder rubbed onto mold solved most of the release issues. By the time we left tonight, we had about 10 parts pulled. 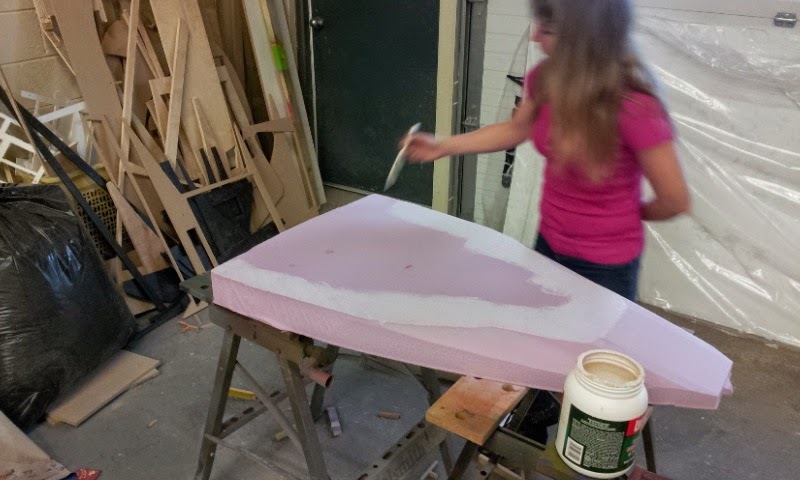 Because HDU is a foam insulator, it can retain the heat from the plastic for quite a while, so we have to mix it up a bit by cycling the molds around in order for them to cool down. The cool thing about our work is I NEVER know what will come next! Our latest job, which I have been a slave to the computer for at least a week, is a water slide! However, it will only be 1:6 scale. It's for a commercial shoot the 3rd week of June. 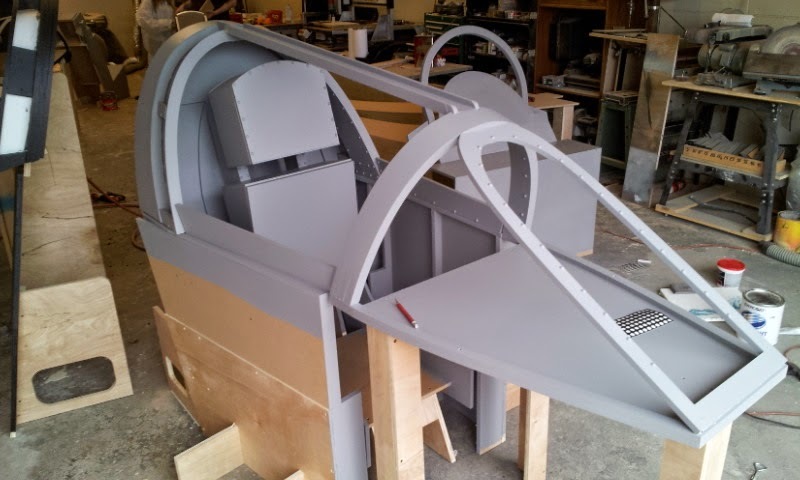 This will be a joint venture between full size waterslide sections, with live actors eventually being composited into our miniature slide. The complicated part is making it look good. One would say "Why not build it like it is in real life?" 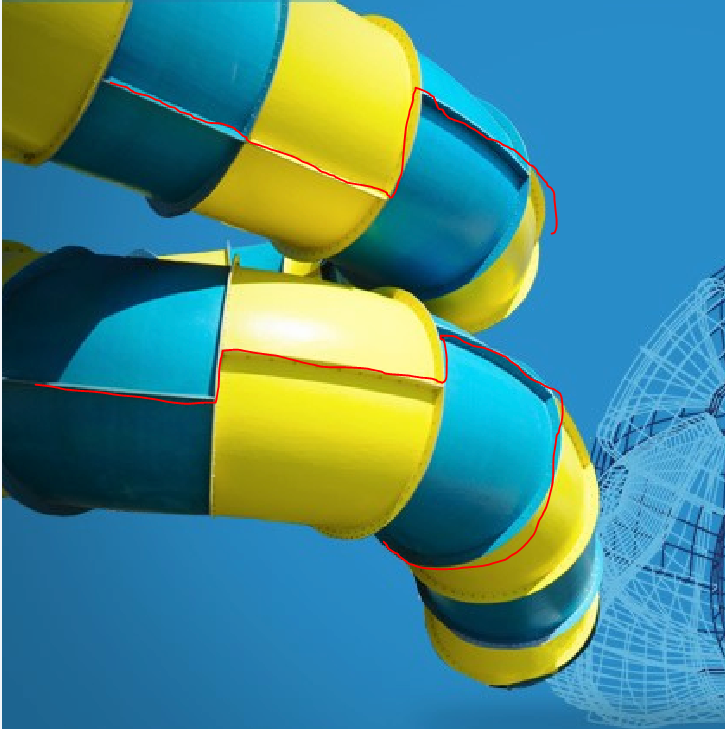 Fair enough, but in real life, a water slide is generally made from 2 half tubes that bolt to the next section. 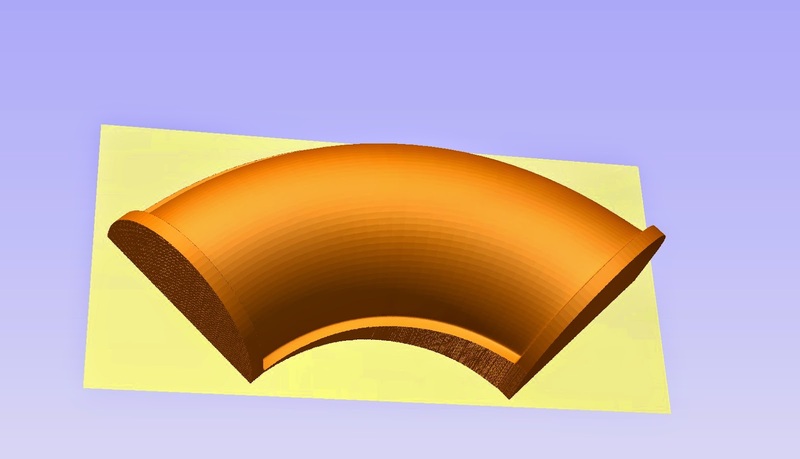 The downward angle is made by offsetting the joint between the two sections. In real life, the tubes are covered, probably so people don't go flying out on the hair pin turns! 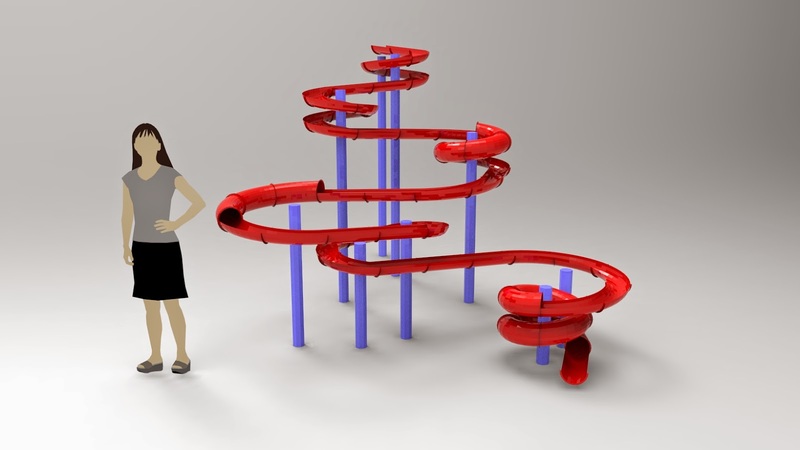 Our slide needs to be open on the top to see the spokeswoman sliding down it. If I was to remove the top half of the above tubes, the edges would become stair-stepped (shown in red). WAAAAY to ugly to make it like that! 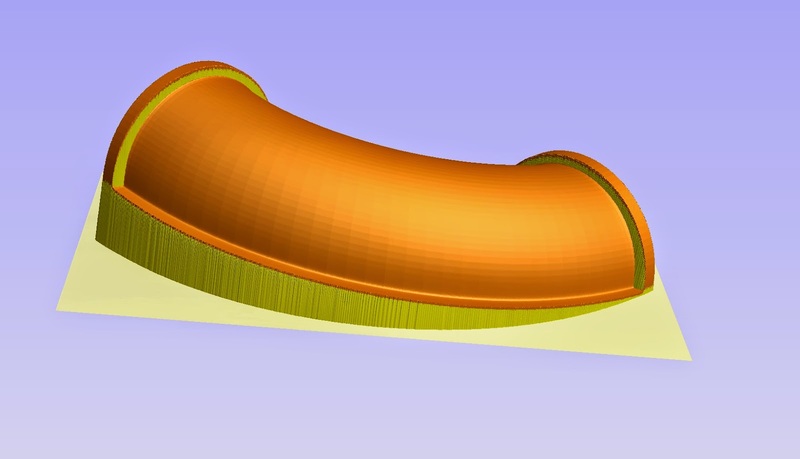 This means designing flanged tube sections, without any stair-stepping, that will align perfectly with whatever section they will join on to. And to be able to flip them for small covered sections, and still line up perfectly. All while maintaining a consistent downward spiral. And that's only the first part! 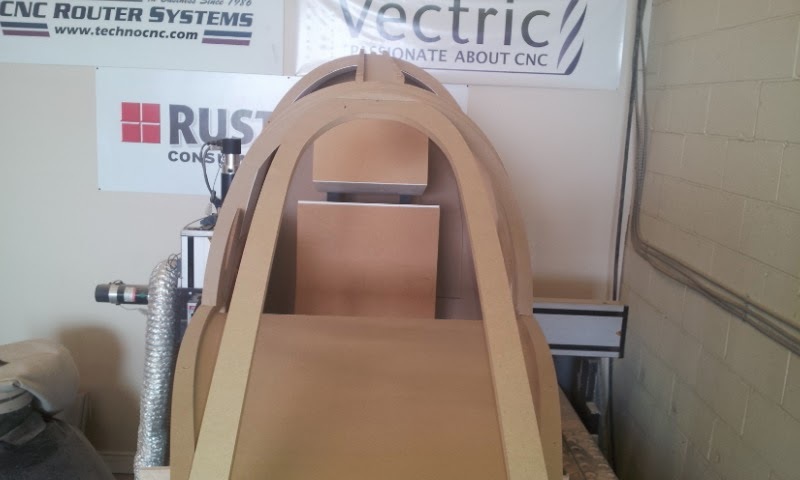 The second part is building a slide, that meets the mechanical requirement of support structures, without having the supports block any section of the tubing run, all while looking great as a whole. 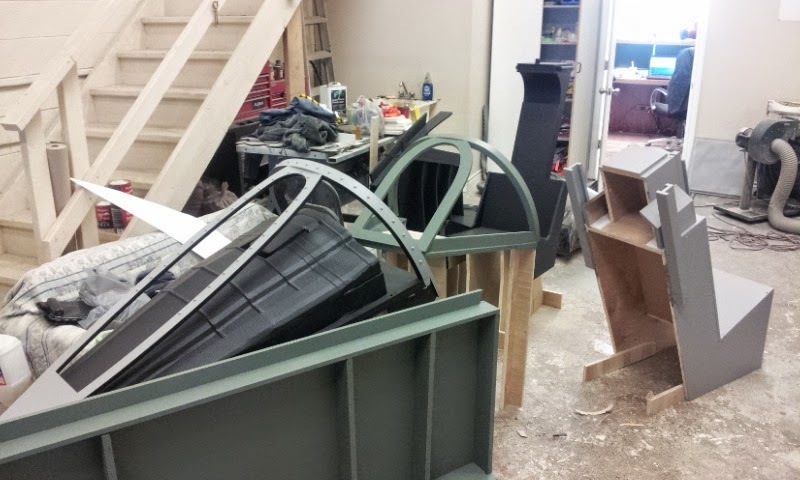 And it all has to work with the other elements that are being made at another shop! This was a total PITA to design. The final agreed upon version was revision #27. That's a lot of revising! As a matter of fact, it was over 40 hours of revising! 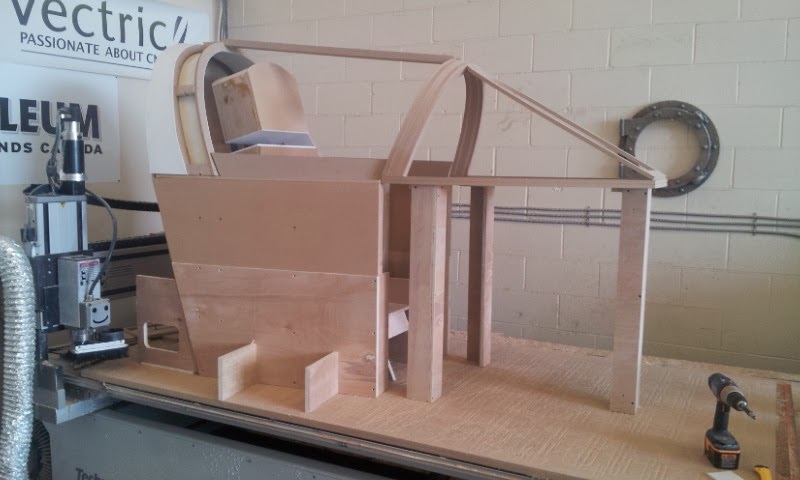 As far as I know, this is the final scale version. The other problem I encountered about 26 times, was with every small change to the run, the whole thing gets changed down the line, forcing a complete re-build to satisfy everyone. As the Art director uses Sketchup to design in 3D, I exported my final Hexagon model to Sketchup, allowing him to add it to the set model he was building for the rest of the commercial. The Sketchup Sally girl is just there for a scale reference. I just have to prep my tube sections for import into Aspire, and I'm ready to machine. 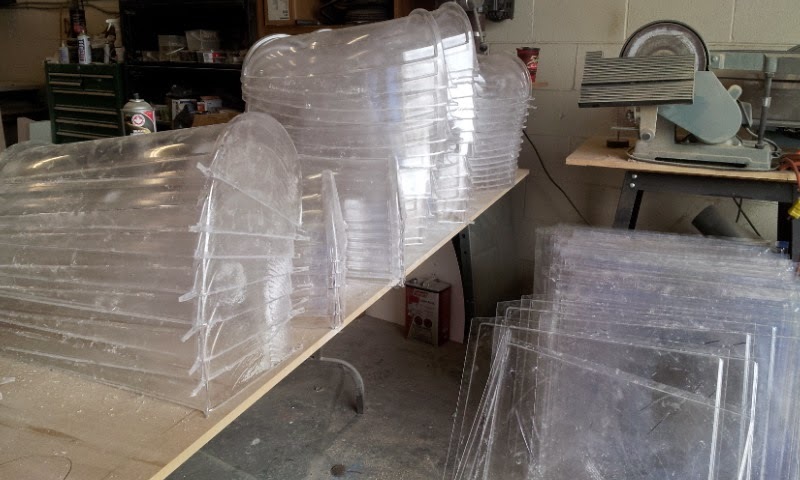 We will be vac-forming these section from .060"pet-g. 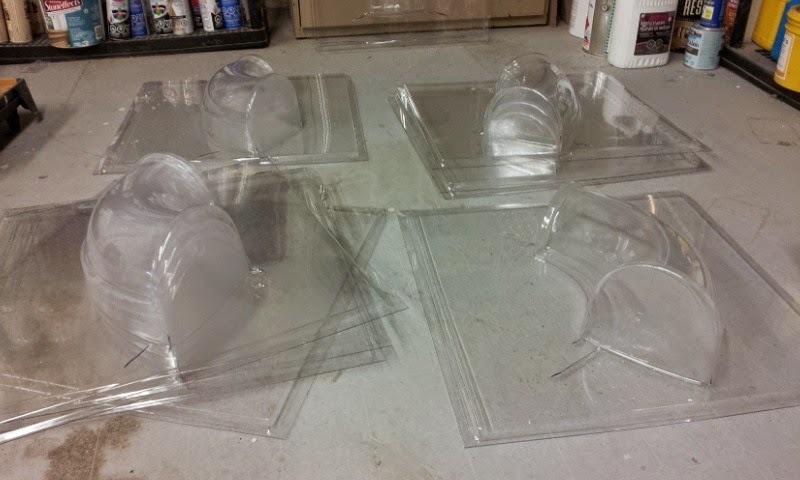 I'm going to try hard-coated HDU for these molds, we'll see, but they should be good for a few pulls at least! The weekend was a flurry of painting! 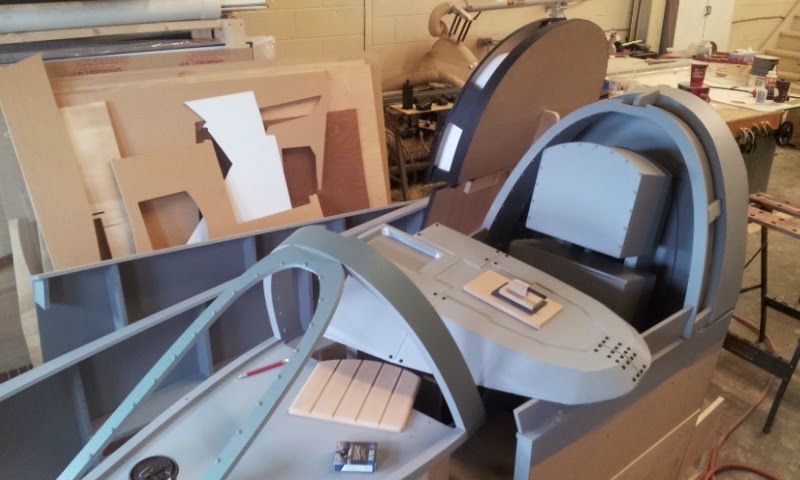 4 cockpits is a lot of painting, that's for sure! Awesome Jody came dressed for the event. Not quite red carpet material, but kinda cute anyways! 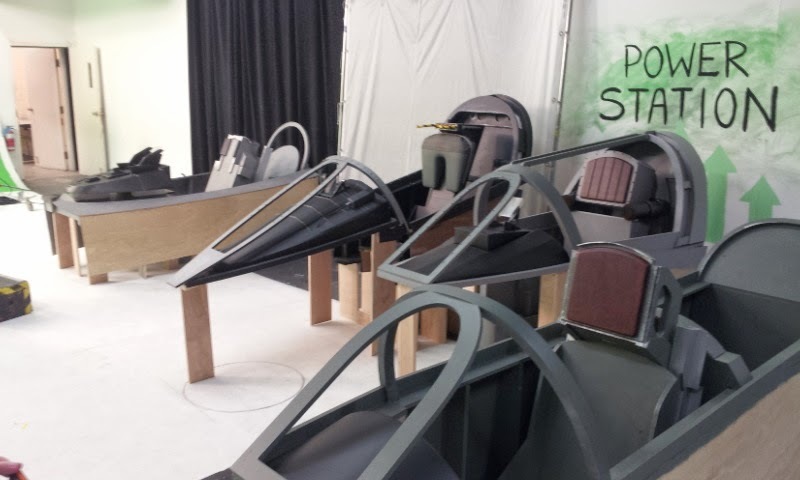 As you can imagine, there was cockpit parts everywhere. Surprisingly, it was easy to keep track of what went with what. 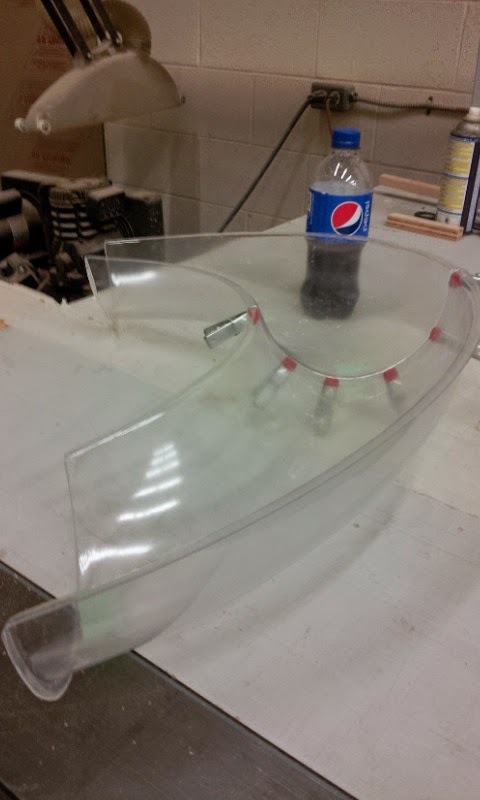 The f-16 dash came out pretty sweet. John drew all the parts for the HUD, and assembled it all before he left on Friday, so it was easy for me to figure out when the time came. 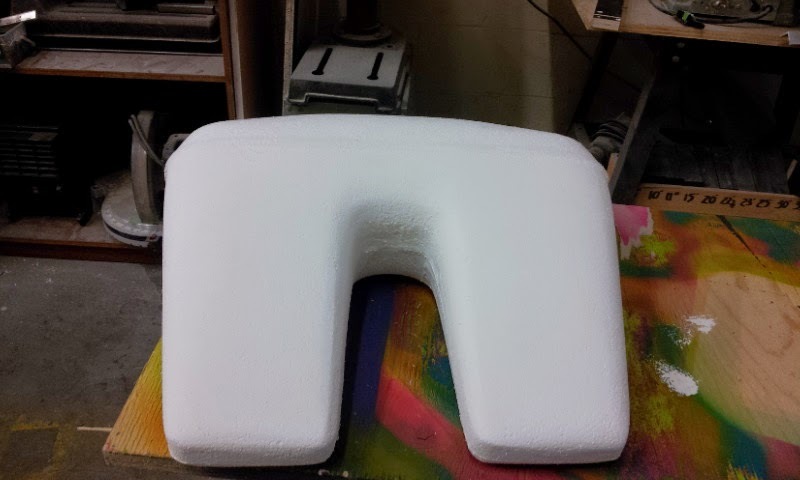 This was machined from white EPS foam then got 2 coats of latex as a primer. 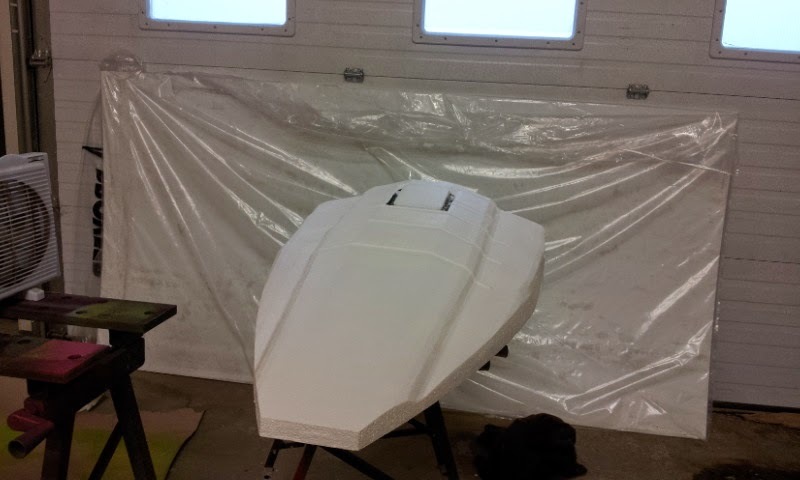 Then I skim coated the whole thing with lightweight filler. 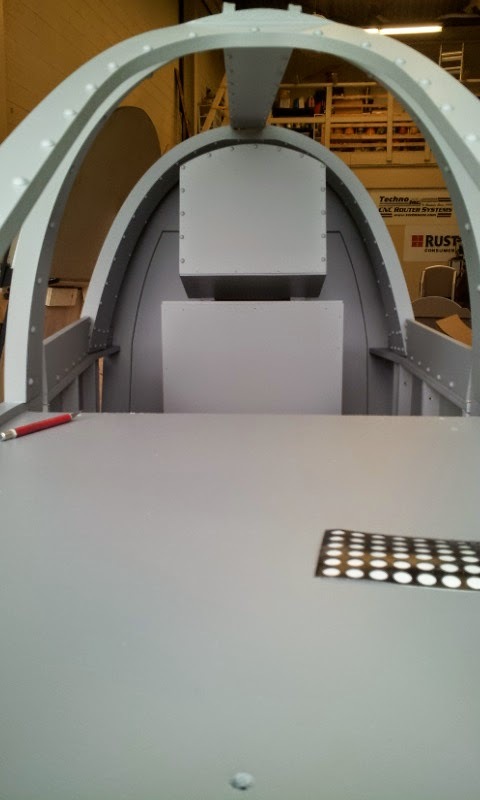 A quick sanding, followed by our rubber bumpers stuck on as rivets, then 2 coats of latex eggshell black. I did a very light dry brush with silver Rustoleum metallic paint, and this part was done. All the other dashes got the same treatment. 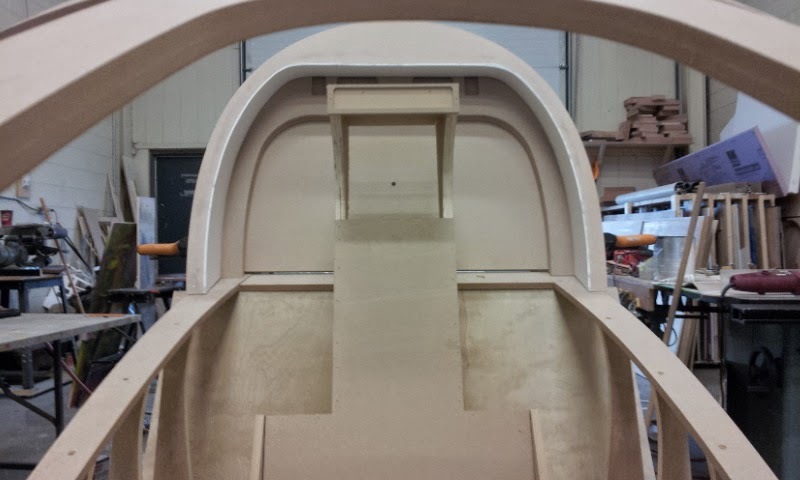 The cockpits themselves were pretty straight forward in the painting stage. 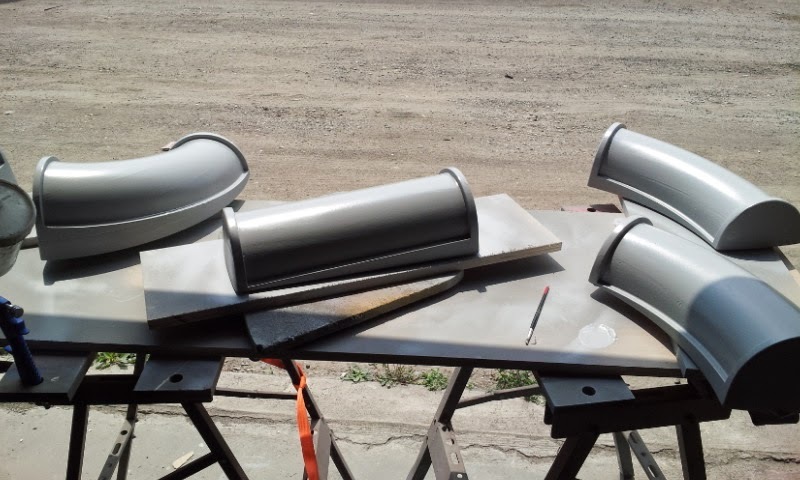 A base coat color, followed by a darker glaze, then dry brushed with some silver around the edges for paint wear, and they were done. It still took all weekend though! I finished the parachute canister on the F4 with some green nylon material I picked up at the fabric store, and added a cut off from an old ratchet strap as the tie down for it. This, of course was painted grey to hide the awful red color that it came in. 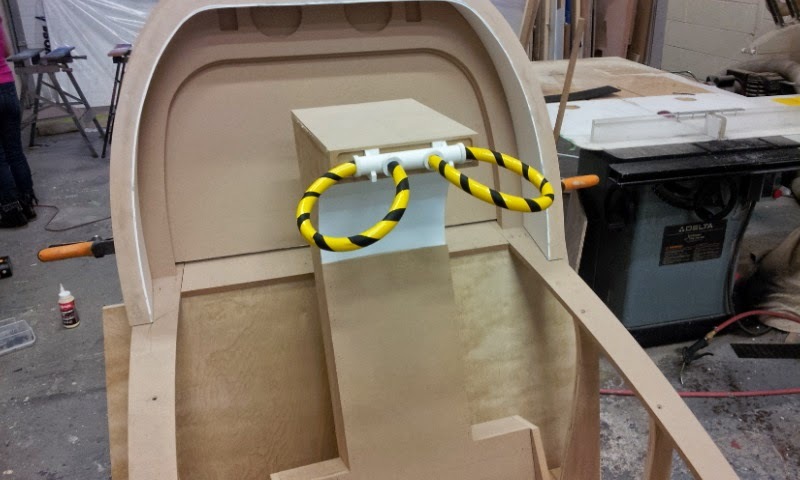 The HDU gauge backs and hoses were put in last. The cube showed up at 9 am Monday. I helped load it up, then John and I headed to the studio to show them how they all assembled. 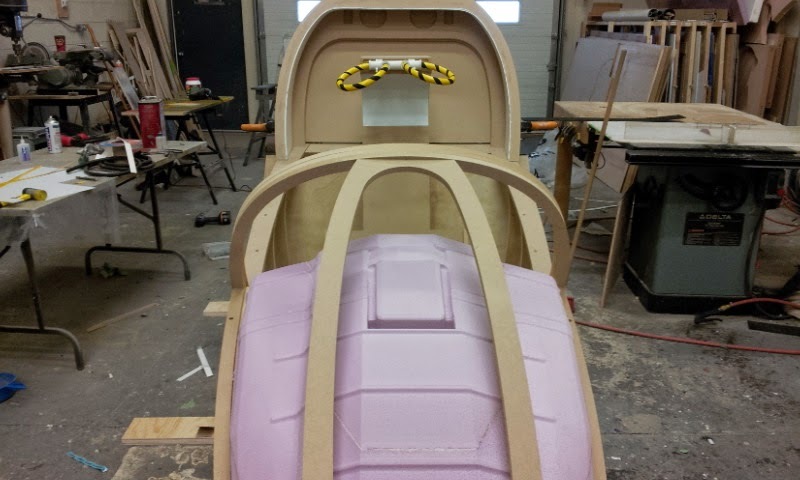 It's hard to see in the picture, but Jody did a faux leather finish on 2 of the plane headrests. It looked quite convincing in real life! The set up went really quick, so we were only on set for about 40 minutes! My kind of set day!! 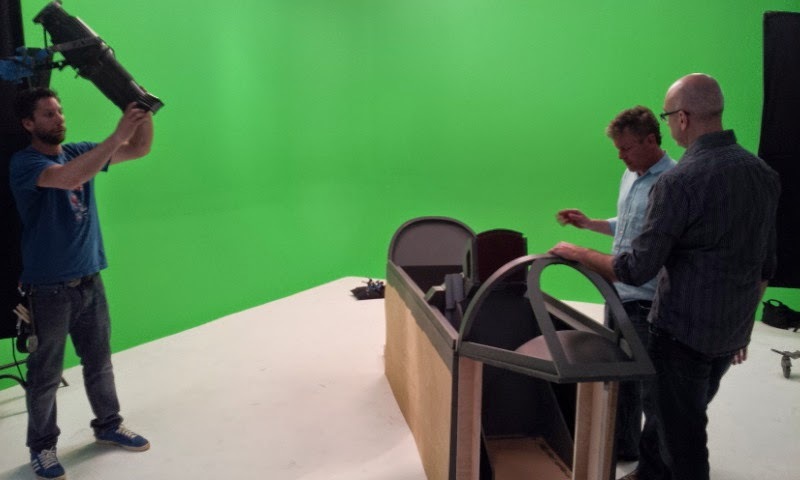 Our next tv commercial gig is going to be kinda cool, so I can't wait to start that build. Miniatures are my favourite! That should start soon, but in the mean time, I've got lots of 3d files to come up with for it. That should be almost as much fun! My best friend being my design computer. A fully loaded Toshiba Qosmio laptop. Over the last 18 months we had become very close. We laughed together, shared moments, even shed a tear or two. This all ended Wednesday night as I was leaving the shop for the day. 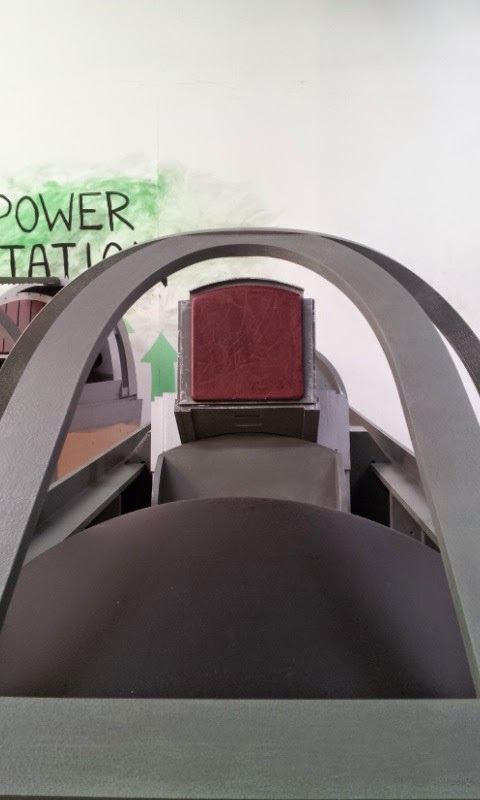 My carefully packed up powerhouse was in it's bag, waiting to head home for a night of design work on the cockpits. Somehow, it slid off the chair and hit the floor with a thud! It wasn't until I got home that I found out it was dead. Wouldn't turn on, nothing. Dead, dead, dead. There was crying, rocking, holding, and I even begged to take me instead. No luck. I ripped it apart, and checked everything. Dead. 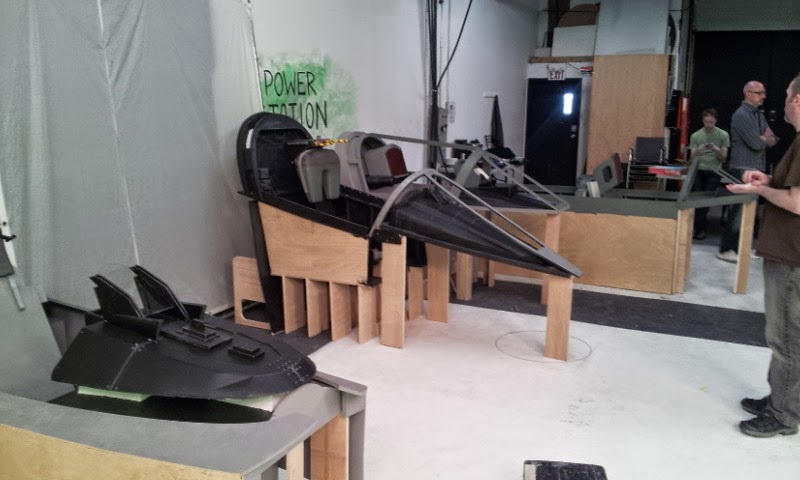 John and I worked pretty solidly on the remaining 3 cockpits. 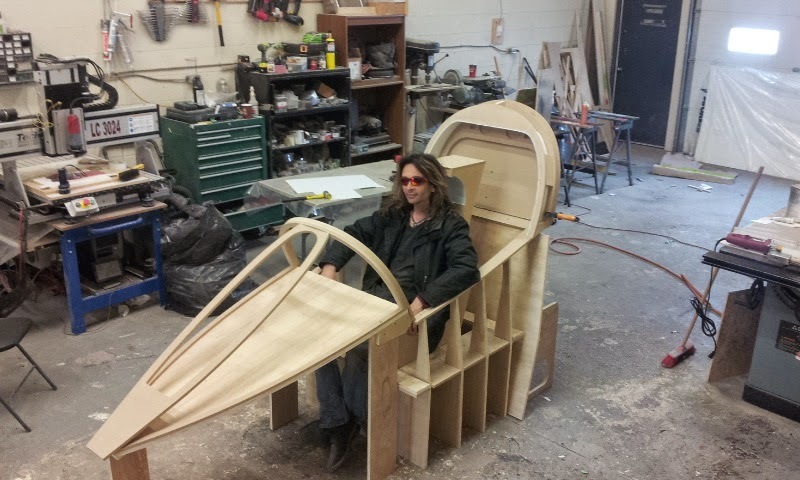 It was great, John had all his files ready for the router, and buzzed away doing his planes, while I worked on mine. 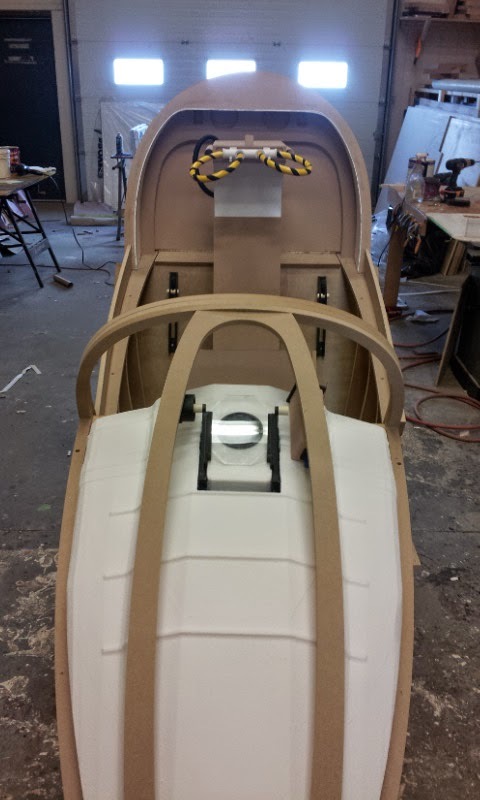 We ended up doing the final fit of each cockpit on top of our Techno. 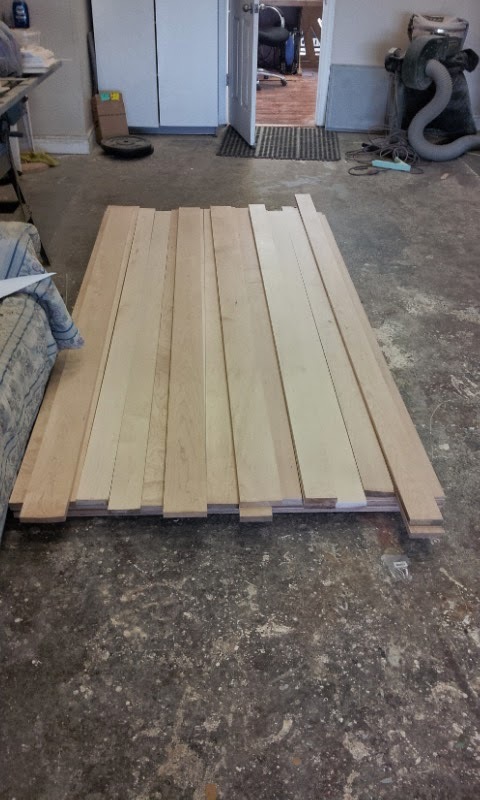 It was the only 5 X 12' surface in the shop that was flat! First thing this morning, Jody and I started with the painting, while John finished up the detail pieces for his planes. I ordered a pile of self-adhesive rubber bumpers that became the many rivet details that will be everywhere on these 4 builds. Tomorrow I'll finish up my last few bits while jody keeps pushing forward on the painting. Madison will be coming in to paint as well tomorrow, so it truly will be a family business!! First thing Saturday, I got to work on the HUD display for the F4. I just pulled the shapes from the CG files of the cockpit we were sent. I had to re-draw them to lose the faceting of the OBJ model, but it was pretty much a tracing job with clean vectors. 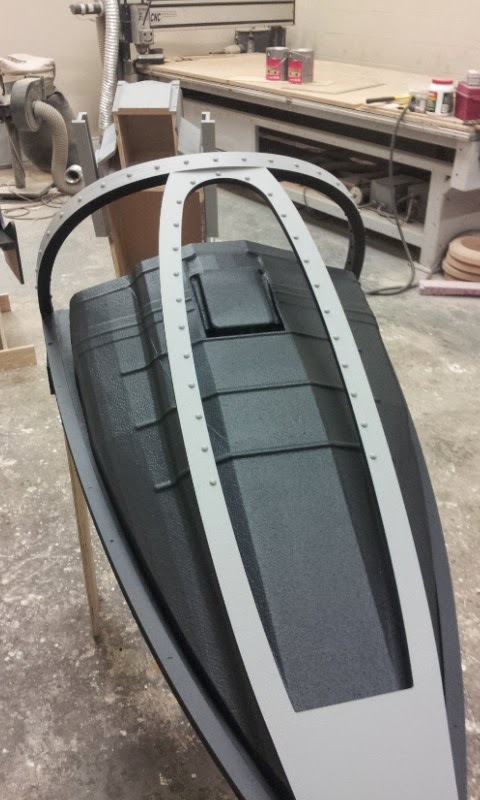 Most of the little details will be made from 1/4" black PVC. 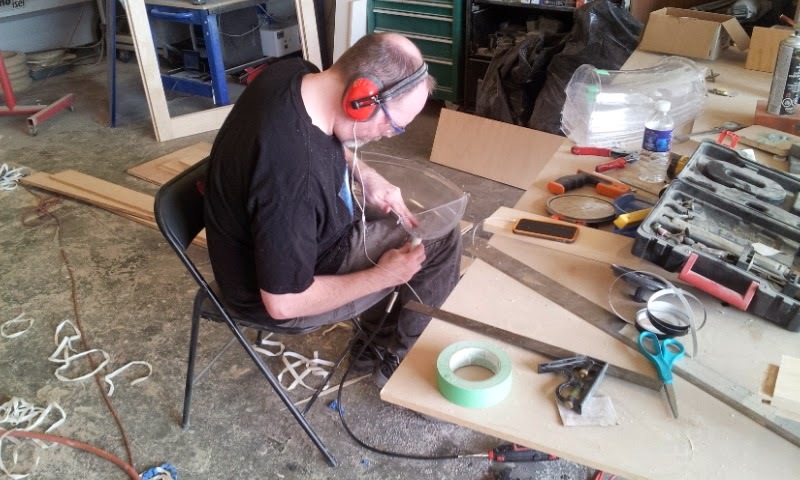 We have a lot of little bits of black PVC left over from the crazy monkey chain we did last week! 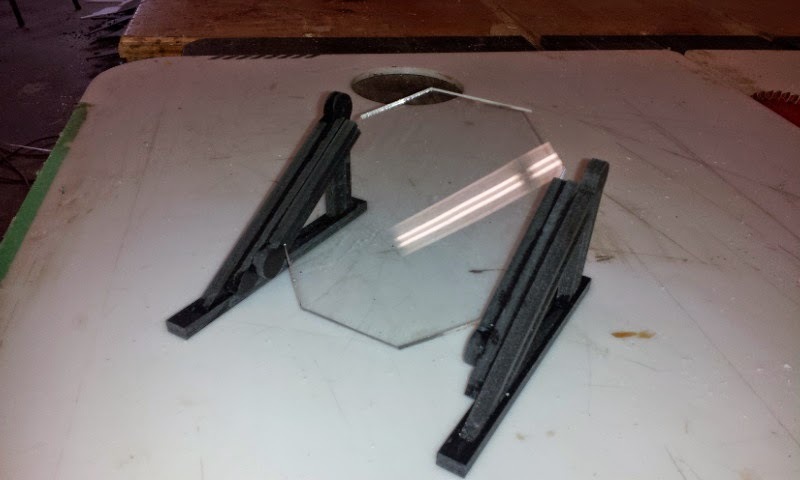 I laser cut the acrylic for the glass, so I could have polished edges, and remove any chance of edge chipping on the cnc. 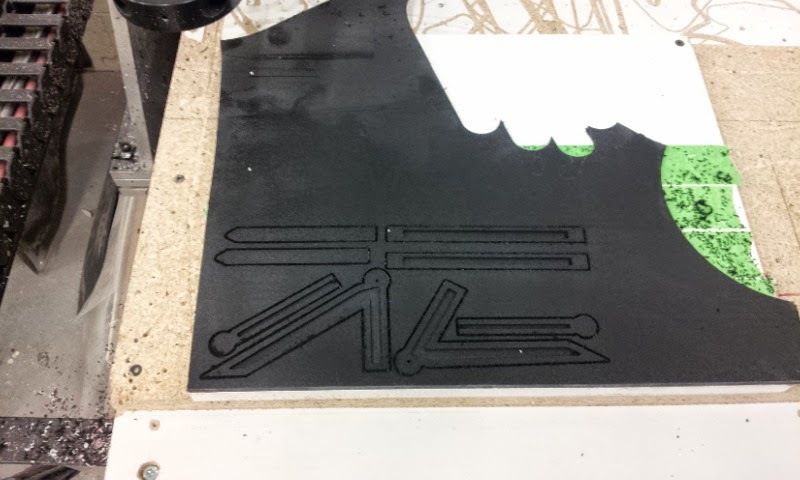 Plus, I don't have to tape the material down on the laser, so it's quite a bit faster and cleaner. I also got the parachute canister machined, and skim coated with a sealer. 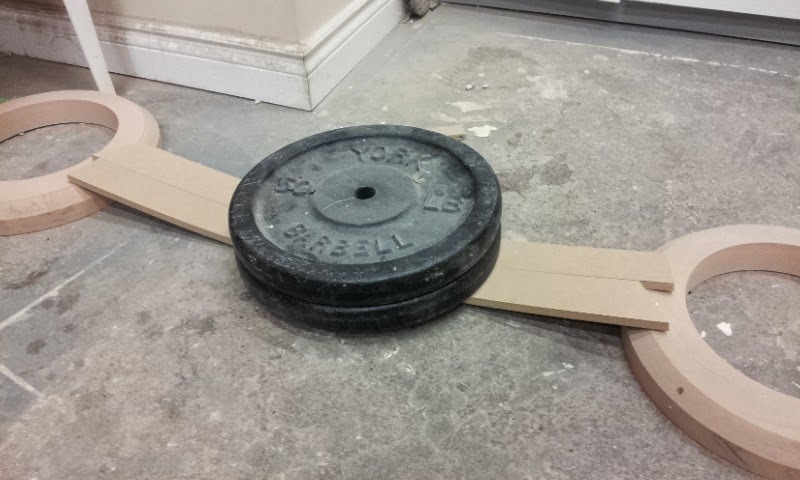 No urethane hard-coat for this bad-boy, it won't require that kind of longevity! 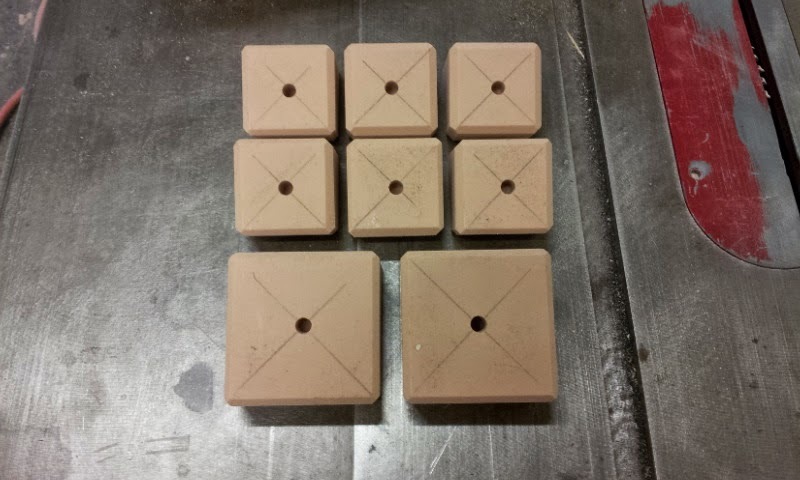 The gauge backs for the second pilot also got made. 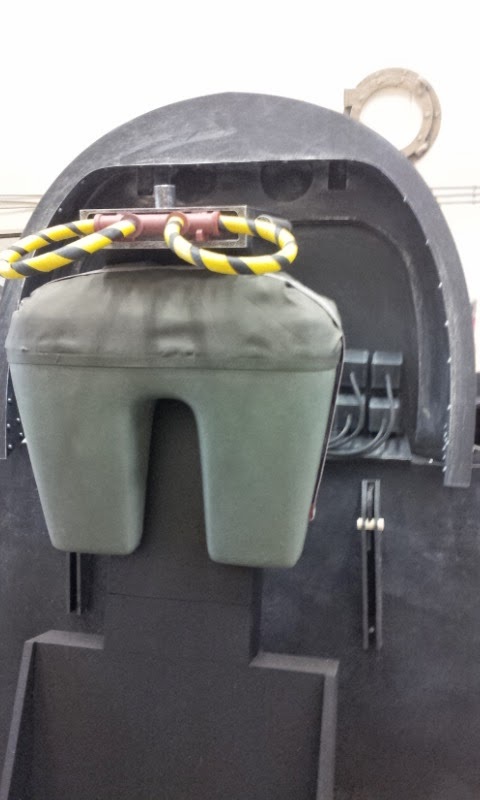 These will mount to the firewall behind the front pilot. Simple HDU blocks, cut on an angle, with holes in the back for fake wiring, with windshield washer tubing as the fake wire. 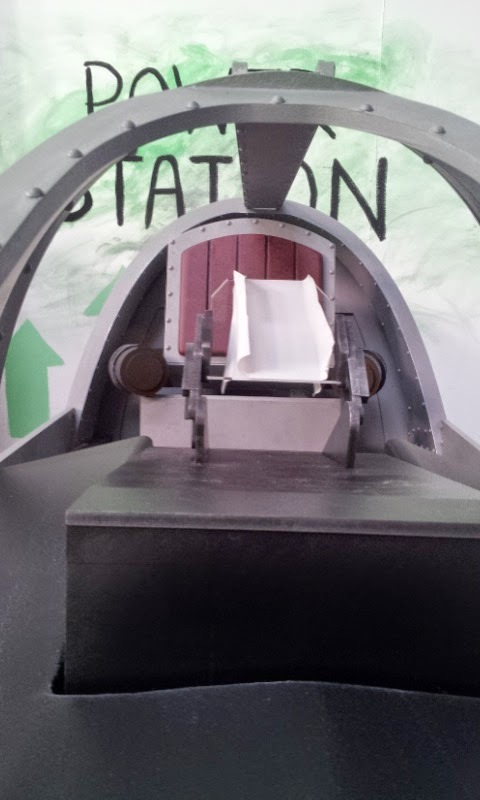 The dashboard console (or whatever it's called) was roller coated with a thick, water-based primer. This effectively removed the "styrofoam" look to it. 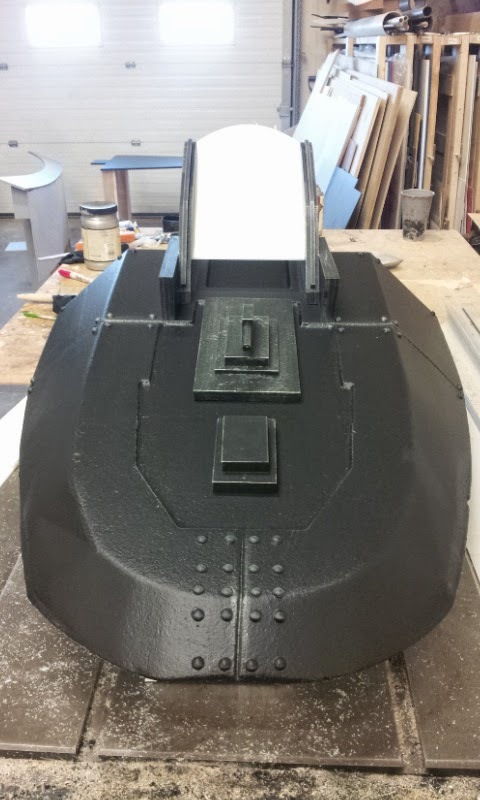 It'll rock with it's final paint color. By late afternoon, everything was test fit, and there were no hiccups! Here's the view from the camera POV. They may shoot higher, but they won't be any lower than this. 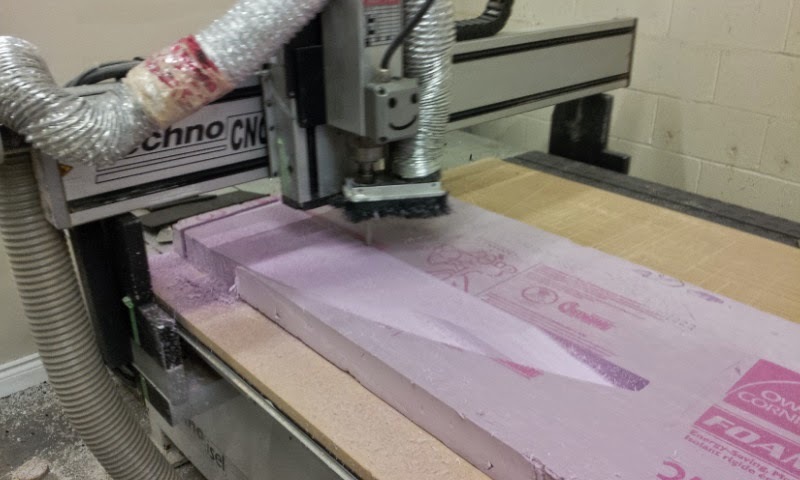 The first thing up today was routing the seat files I drew up late last night. These were extracted from the CG model supplied by the FX guys. I think I have to adjust it a little, but I'll deal with that in the morning tomorrow. 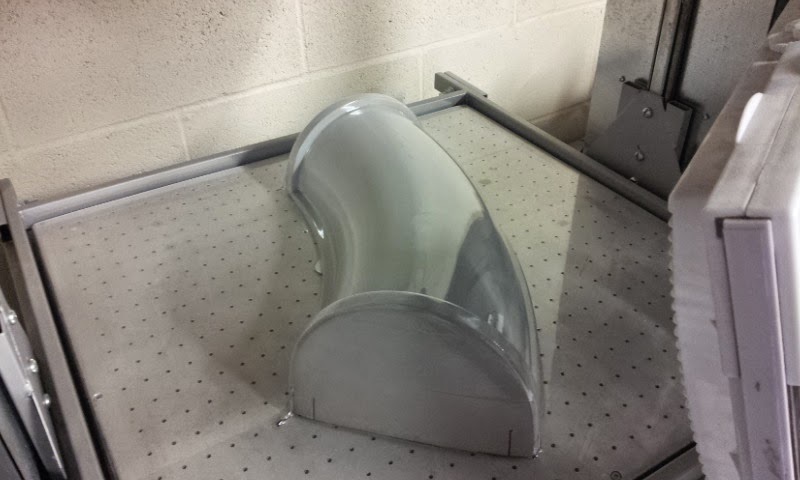 The dash cowl got machined while i worked away on the other odds and end. Jody contact cemented the final pieces, and we got them all assembled. It certainly fit well! Although, I kept checking the files as it looks like it sits really high. But all the models and files seem to point to this exact thing as being spot on. One more crossed off the list! 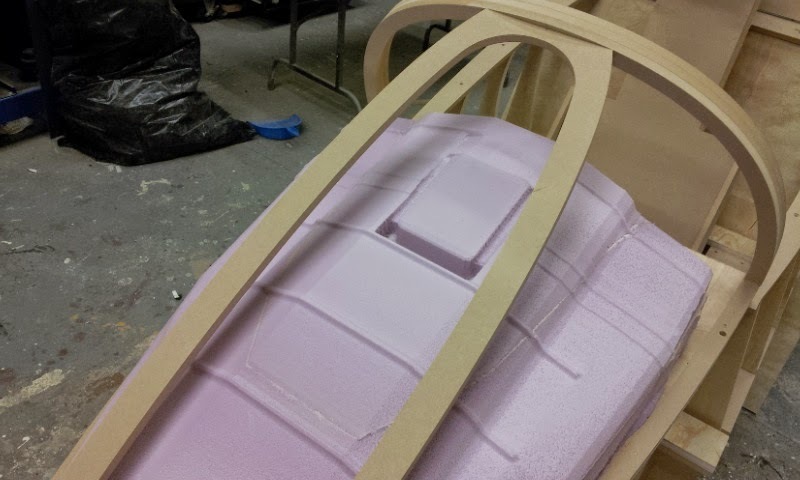 The other part of the seat that will be clearly visible in camera is the 2 handle type things at the top of the seat. I assume they're "Holy Sh!t" handles for when the pilot has to eject! 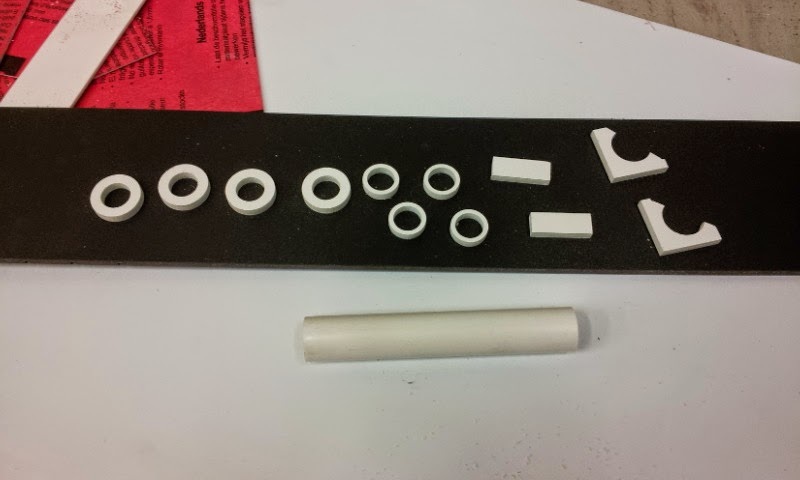 The main body of the handles was quickly drawn up with some spacer rings, and a section of PVC pipe. 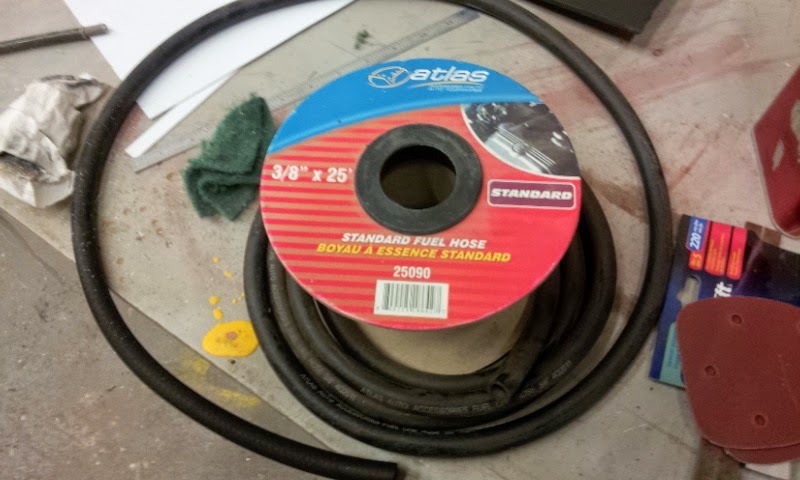 This fuel line hose will fit the bill perfectly for the handle portion. 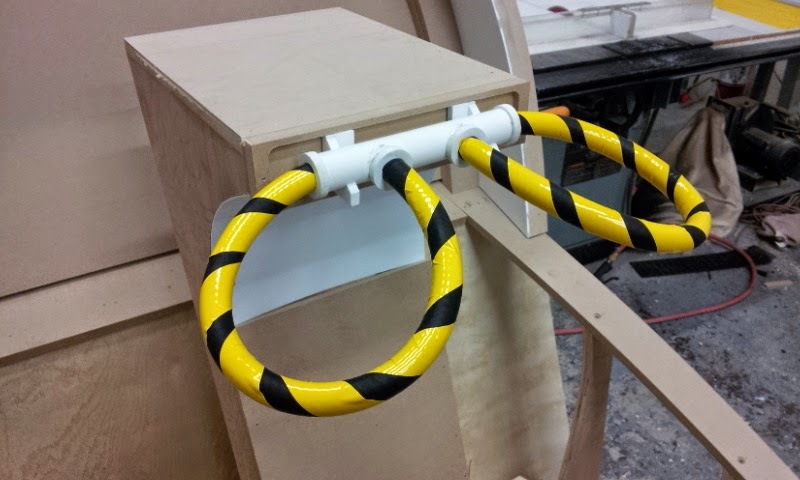 I wrapped the hose in yellow vinyl, and fit it into the rings I cut. A little paint and aging, and this part will be great! 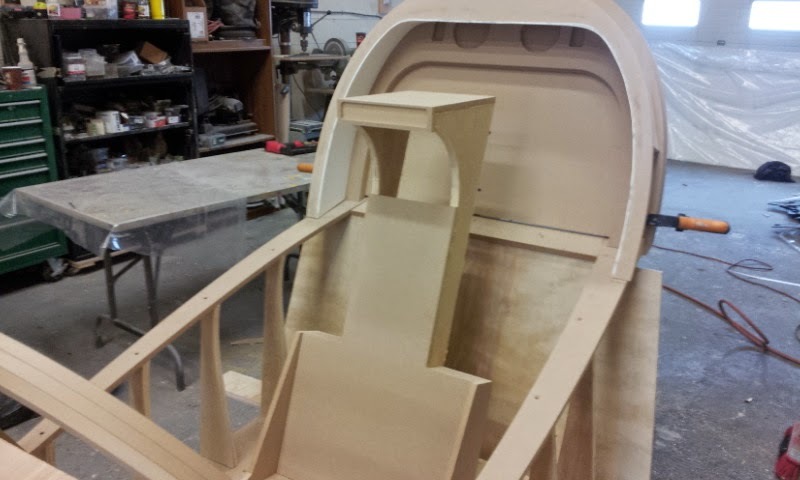 At least it's starting to look like a cockpit! I couldn't help myself, so I had to jump in! You'll notice I'm wearing my sunglasses. This is for 2 reasons. 1) I'm super awesome, and 2) it keeps the bugs out of my eyes. At these supersonic speeds, a bug could be blinding! It does confirm that I will need to adjust the height on the seat though.